My absolute LAST ever post on Sad Puppies ever; or, how I met Larry Correia. Anyone who reads my blog regularly (so nobody) knows that I’m pretty politically opposed to the Sad Puppies- and, at this point, that I really don’t care about it anymore. I just don’t have the energy to care about online drama. 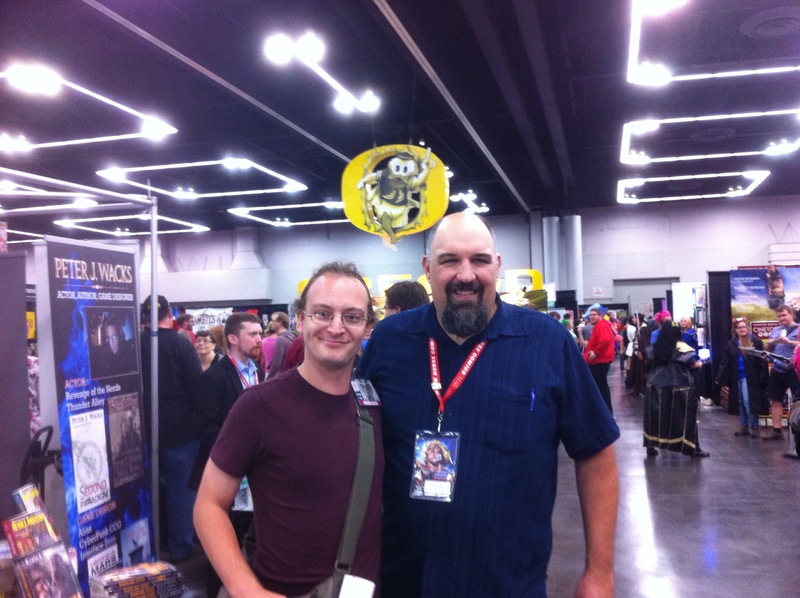 At Rose City Comicon (I really should have posted this sooner, but first weeks of the semester and all), I ran into Larry Correia, founder of the Sad Puppy movement. Honestly, I was a little intimidated to talk to him. As easy as it is to disparage people online who are on the opposite side of the political spectrum, it’s another thing entirely in person. Not just because Larry’s a really big dude (which he is), but because it’s actually pretty tough to completely dismiss someone for their political beliefs in person- annoying, I know. So after walking past his booth once and not saying anything, I worked up the nerve to go chat with him. My friends might have helped pressure me a bit; just a bit. And, well: He’s actually a really nice guy in person. We spent ten or so minutes chatting about his experience so far in Portland, the Sad Puppy movement, Vox Day (Larry readily admitted that Day is a terrible person, but vagaries of politics put them on the same side on one issue), Marion Zimmer Bradley (terrible person, more on that below)*, Jim Butcher (we both think he’s a badass), Brandon Sanderson (his work ethic is terrifying), etc. Oh, and his Grimnoir trilogy, which I liked quite a bit, despite my investment in the Sad Puppy drama on the opposite side of him at the time. I actually have changed my opinion about the books since- it’s still more violent than I usually prefer, but I’ve decided that it’s not nearly as problematic as when I first decided. (Malazan, I blame you for that.) Regardless, I liked it when I first read it, and I like it still. The internet makes assholes of us all: especially me. Posted in Great Hugo Readthrough and tagged Hugo Award, Hugo Controversy, Internet Drama, Larry Correia, Marion Zimmer Bradley, Premature Balding, Rose City Comicon, Sad Puppy on September 30, 2015 by mountainwashere.